Often we need to create objects with the same color as the existing one and we rely on our eye to choose the perfect match. every color has its own RGB and Hex code. RGB means Red-Green-Blue content of a color. Today I have found a software called Cosmin Color Detector that effectively identifies the RGB & Hex Code of Any Color Pixel on your computer screen. With this software you can identify the color of any images. You can also scan a photograph and find the match of the color with this software. The software is available for download from the following links. Its a 448 Kb executable file and not digitally signed. Although it has been mention as working up to Windows XP, I have found it working on Windows 7 64 bit. Installation requires administrative rights and 1.2 Mb of free disk space. Installation completed fast and clean. There is no portable version of the software but you can manually create a portable version by copying ColorDetector.exe and ColorDetector.txt from the installation folder [C:Program Files (x86)ColorDetector200] and executing ColorDetector.exe for launching the software. Cosmin Color Detector is easy to use as is written in the read me manual. Simply position the “Color Detector” window anywhere on the screen, so that you won’t overlap the portion of the screen that you are interested in, for detecting a color. 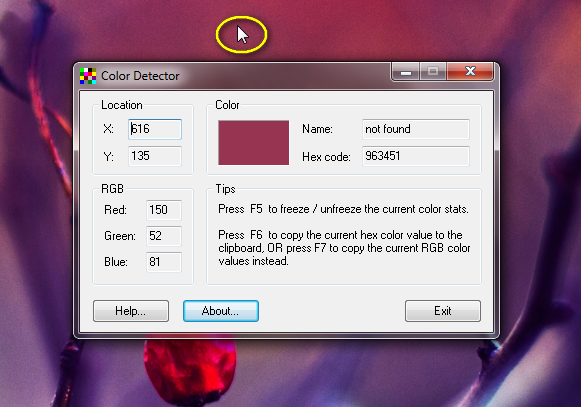 Then point the mouse cursor, anywhere on the screen, and check the various fields on the “Color Detector” window. the three keyboard shortcuts: F5, F6, or F7. – F5 toggles on or off the “freeze mode”. In freeze mode the fields on the Color Detector window are no longer updated continuously. This helps if you want to be able to keep static a particular color. – F6 copies the hex color value to the clipboard, for example ffff00 for yellow, or 008000 for green. This feature is useful for web site development in finding out color codes to place into your HTML and CSS files. RGB (128, 0, 128) for purple. This feature is very useful for Windows programming as the text copied to the clipboard is the Windows API macro for specifying color values. For the above keyboard shortcuts to work, make sure that Color Detector is the active window before you press the keys. If another application or window is the active one at that moment, these keyboard shortcuts will not work, and instead it might activate features in the other active window, that use the same function keys as Color Detector. Please note that Cosmin Color Detector can use considerable resources at times. The developer also knows it. Because this software is using the idle loop to track the current mouse cursor position, it can eat up precious computing resources. Don’t be surprised if you see the CPU usage go up to 100%. If you have any ideas on how I could improve the algorithm please let me know. Anyway I have no objection against its resource usage because I am not supposed do another work during finding the color match. This entry was posted in Free, Graphics Management, Software, Windows and tagged Cosmin.